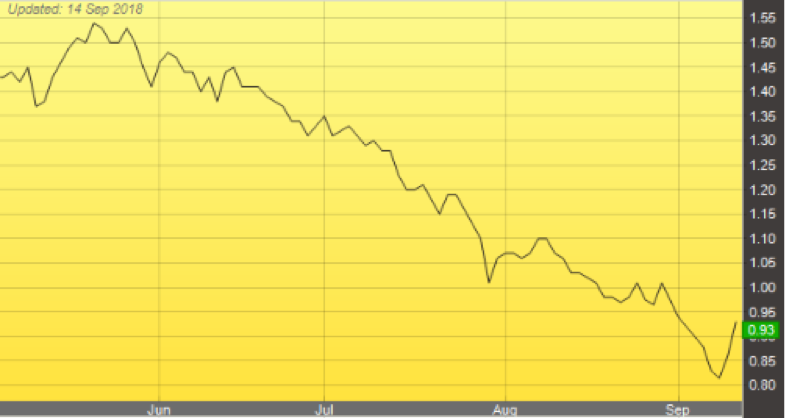 The above chart shows that the price has been falling from Rm 1.53 on 21 May to its lowest price of 83 sen on 12 Sept. a drop of 70 sen, 45% in 4 months. In the last 3 trading days, it has gained 3 sen, 5 sen and 7 sen respectively. It has risen 15 sen in the last 3 trading days. As my wife, my nominees and I had bought more than 160 million shares with margin loan, we have to sell to meet margin call when the price drops. The more we sold, the more the price would fall to create more margin call. Forced selling is vicious cycle. I must admit that we are partially responsible for its price fall due to my margin call and we had to sell. Since the price has increased by 15 sen per share, all my problem is resolved. We don’t have to sell any more. The volume changed hands for each of the last 3 trading day is more than 10 million shares. On the last trading day 13.5 million shares changed hands. Only rich funds who had bought the placement shares of about 50 million shares at much higher price a few months ago are buying aggressively. You may like to see the following company announcement of share placement. On behalf of the Board, Kenanga IB wishes to announce that the Board had, on 23 March 2018 i.e. the Price-Fixing Date, fixed the Issue Price at RM1.38 per Placement Share. The Issue Price represents a discount of 6.72% to the 5-day VWAP of JRB Shares up to and including 22 March 2018, which is the last full trading day immediately prior to the Price-Fixing Date, of RM1.4794 per JRB Share. This announcement is dated 23 March 2018. It looks like a trend reversal from down trend to up trend. The best time to buy is now at the pivoting point. NOTE: I honestly believe its price should continue to rise. You buy at your own risk and I am not responsible for your profit or loss.